Composer Bear Series MUSICAL. Plays the melody Tristesse. German Mohair Teddy Bear, fully jointed. About HERMANN-Spielwaren GmbH, Coburg, Germany. 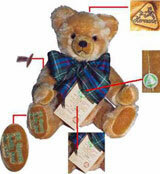 HERMANN-Spielwaren GmbH is one of the oldest still existing Teddy Bear companies in the world. Founded in 1920, the company is world-famous for their craftmanship, extraordinary designs, exclusive small editions and that every bear, hand-made in Coburg, Germany has its own personality. Each bear is made by highly skilled craftsmen and women and they have won many prestigious Awards. Limited Edition Size: 15.75 inches tall.